The Electrophilic Aromatic Substitution reaction starts when one of the pi electrons on the benzene rings breaks as it reaches for the super electrophile. While this is similar to alkene reactions AT FIRST GLANCE the remainder of this mechanism is very different and unique. 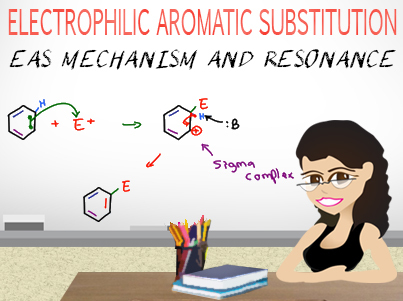 The sigma complex intermediate is capable of stabilization through resonance, as shown in step by step detail in the video below, along with a step by step breakdown of the EAS reaction mechanism. Pay careful attention to the location of the carbocation intermediates. This is the KEY behind understanding ortho/meta/para directing effects later on. This is Video 2 in the Electrophilic Aromatic Substitution Video Series. Click HERE for the entire series.